Wireshark is the most popular network packet analyser that lets you see network traffic going out and coming in to all computers in the network. So, you can see anything on your network that’s not encrypted. The only problem is that Wireshark is not available for Android. While most of the people now prefer Android phone over computer for accessing internet and doing most of the work, Wireshark for Android is in demand. Unfortunately, you have to use the available alternatives. Before I tell you the best Wireshark alternatives, you should know that these apps require root access. Without root, you can just monitor traffic from your device. If you want to use these apps, you need to first root your phone. Here are the best Wireshark alternatives for Android. 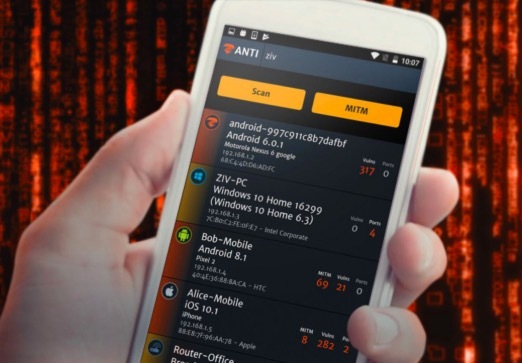 The zAnti is a powerful penetration testing tool for Android device. It is used for for network testing and can works as network sniffer. It can modify HTTP requests, exploit routers, hijack HTTP sessions, change MAC address and more. Security persons use this app to find vulnerabilities in a network. The app is available for free and you can download it from official website by entering your email address. cSploit is similar to zAnti. It is also. penetration testing tool for advanced users for testing network. You can also see this app as Metasploit for Android. You can use it to see host systems fingerprints, map local network, perform MITM (man in the middle) attacks, built-in traceroute functionality, ability to add your own hosts, create or forge TCP and/or UDP packets and more. cSploit is an open source available for free. The app is in active development and they are actively adding more features. Unlike zAnti and cSploit, this is not a full-fledged penetration testing tool but it can capture and record network packets. With this app, you can also decrypt SSL communication using MITM (man in the middle) attack. It uses local VPN to record your traffic and does not require any root permission.This is the reason, it is available on Play Store. If you want to capture HTTPS traffic, you need to install the SSL certificate. Do that it you require or you can always change the settings with available option in settings menu. The app is available for free with ads. Along with these three apps, tPacketCapture, WiFinspect and Debug Proxy are also notable apps for Android devices that can work similar to Wireshark. You can use these apps to analyze the network traffic and see what is going on your network. If you were looking for best Wireshark alternate for Android, you have the list of best apps. If you know any similar app, you can always let us know using the comment section.